I got this book from Netgalley because it was a read now and I was putting it off for so long. I finally got round to reading it because I had a really long car journey to france and thought I could read it then but as usual I got side tracked and listened to Psycobabble (which is a great podcast). The characters were very three dimensional, I felt even the minor characters had a whole back story in Katie's mind. I especially loved the contrast between Seth and Quinn, I thought that was well written. I also loved how Katie used politics as a base for the whole book to go back to every time. I thought that the addition of Quinn being brought up to be a republican compared to Seth who is a democrat because this helped me see both sides of the story rather then just one. My huge problem with this book was how sexually explicit it was, I felt really uncomfortable reading these parts and extremely grossed out at some sections of these scenes. In conclusion, a overall okay book with only one problem which I think is relatively uncommon in YA books. It is definitely aimed more at older teenagers. I can't wait to see what Katie Pierson has install for us. 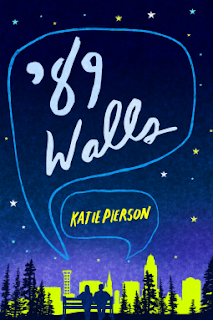 I'm giving '98 Walls 4/5.